Since my last post about my Betta fish (aka Siamese Fighting Fish), I may have purchased a few more. All you have to do is look at the plant stand in the window to see that the houseplants have disappeared and the Betta bachelor pads have increased. 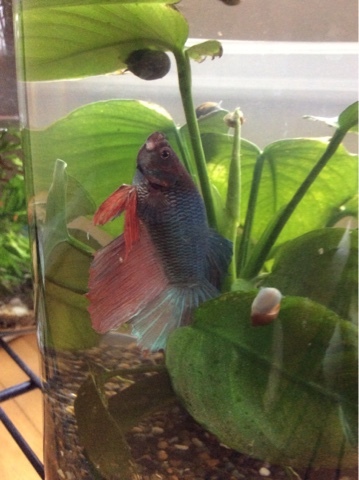 Today, I want to introduce some of the plants I keep with the Bettas. 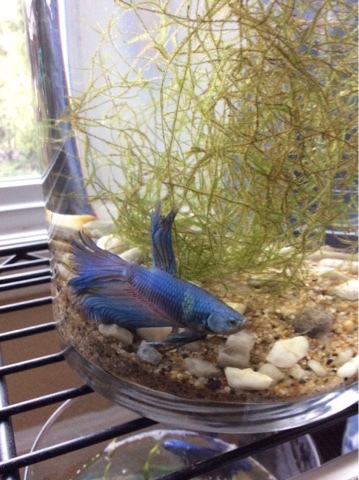 Bettas do enjoy plants to lounge about on in their living space. The bowls I use are on the smaller size, so I do weekly water changes to keep them happy and maintain good water conditions. We are fortunate to have good water quality right out of the tap here in Portland. The height of the container also restricts some of the plants I can use. Several of the taller vases at the top of the stand have Amazon Sword plants (Echinodorus amazonicus) in them as they are too tall for the other cylinders. 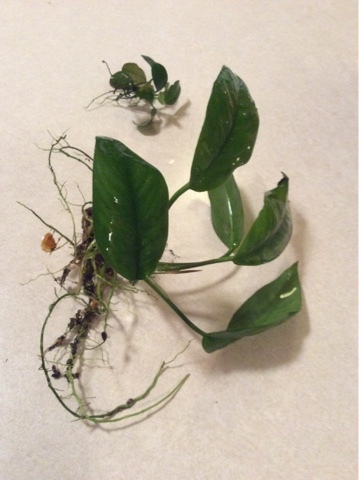 Below are the three true aquatic plants I have had the most luck with, although your results may vary. Anubias is a slow growing African genius of aquatic plants named for Anubis, the Egyptian god of the underworld. They have broad thick leathery leaves, generally grow in low light, and are suitable for most fresh water conditions. Anubias barteri, Anubias nana, and Anubias nangi are common varieties often seen in aquarium stores. The plants vary in size, some being quite large and some dwarf (2-6" tall). A small potted plant might cost $6 and a large potted plant $25 or more. Look for healthy plants with nice unblemished leaves (no algae, no holes) and thick rhizomes. Anubias come in different sizes. 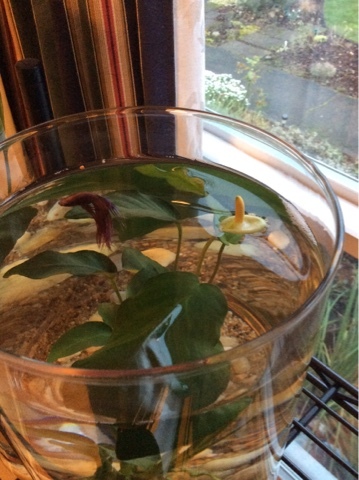 Anubias have a flower similar to a tiny underwater Calla Lily or Peace Lily, but it's not much to look at. 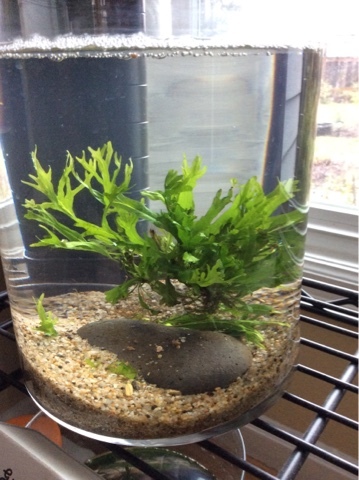 The plants can be tied to a rock or piece of driftwood to help keep them submerged. Leaves will sometimes grow out of the water too and will be fine. I buy plants potted and generally remove the net pot and glass fiber "soil" they come packed in from the aquarium store and half submerge the roots in the gravel. The top of the rhizome should always be above the gravel line. Plants with multiple rhizomes can be carefully cut apart with a sharp knife and planted separately. 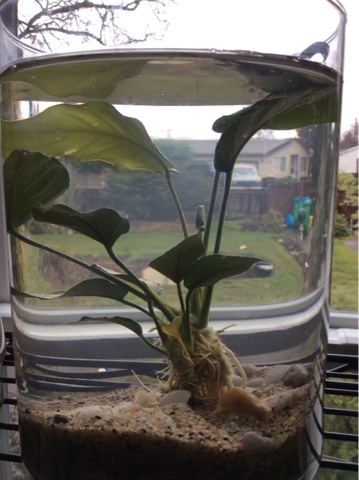 Anubias - there is a flower bud in the middle back. Microsorum pteropus, aka Java Fern is from Indonesia. There are several different kinds sometimes available at the aquarium store. I have the best luck with this smaller sized one. They cost about $5-7 for a little piece. It seems like a lot of money when you buy it for what you take home. The larger narrow leaf and trident varieties can cost more. Sizes vary, growing to 4-8" tall, with a creeping rhizome. It likes moderate light and does well in poorer light and water conditions. Java Fern reproduces by making adventitious plants on the tips of its leaves. Eventually the baby plants get large enough that they can be separated. I move the babies around to different bowls as needed. 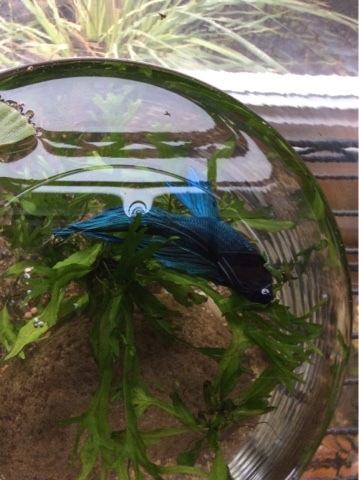 The Betta Boys tend to uproot these, so they are generally free floating in the bowls, which is exactly what the plants like anyway. Plants can be tied bare root to driftwood or to a rock if desired to keep them in place. 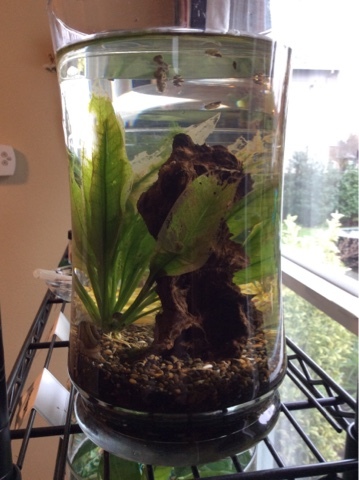 Vesicularia dubyana, aka Java Moss, is one of the easiest plants to grow in a Betta bowl. It is native to SE Asia. It doesn't require much care, but enjoys warm (70 to 75 degree) water and good light. 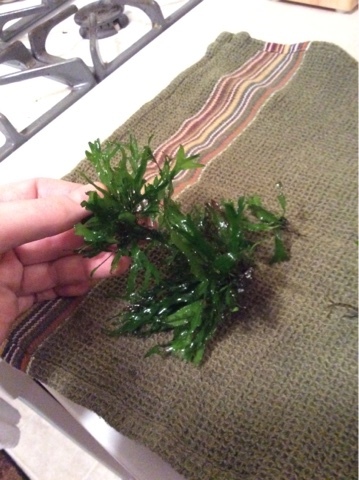 Java moss also likes to float in the bowls, or it can be attached to a rock or piece of driftwood with fishing line. It can be a prolific grower and sometimes needs some tough love removal. 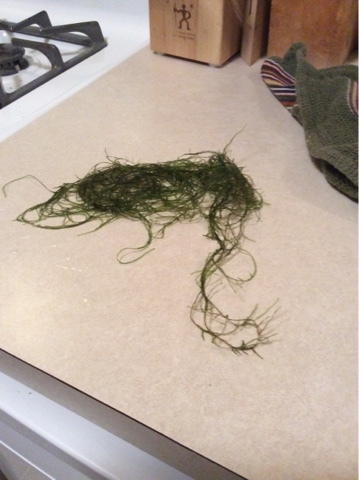 It is easy to pull the strands apart in big clumps to place in another bowl or to replace less healthy clumps. Sometimes you just have to throw some of it away because you have too much. If the light is too high, Java Moss can get algae on it, making it unattractive. Time to throw it away then. 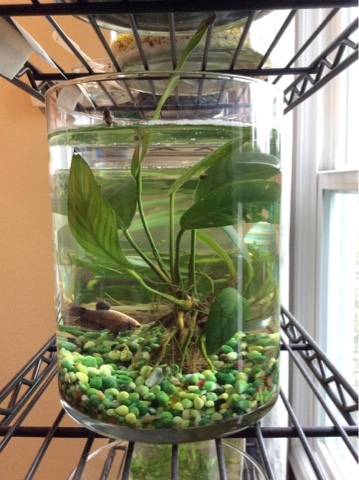 One last piece of advice, is to please be sure you're purchasing an actual aquatic plant for your Betta bowl. Sometimes the big box pet stores will package house plants that are not true aquatics and sell them as aquarium plants. These plants die a slow watery death and that's not good for the plant or your fish. Please give these plants a try, your Betta fish will be very happy! 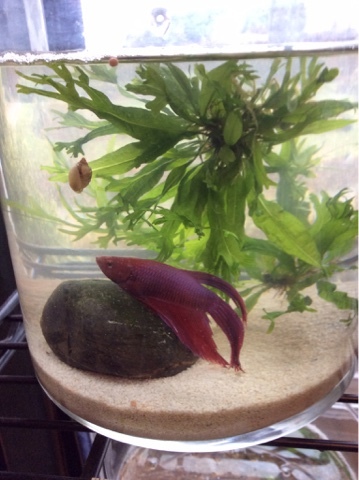 I want a Betta ! They are very easy to take care of and I enjoy their beauty. When its too cold outside to enjoy the goldfish at least I have the Betta in the house to watch. Wha??!! How did I not know you're a beta hoarder? We have 17. Just kidding. We have one. We acquired it on a walk. Yes, weird. That sounds like an interesting story. 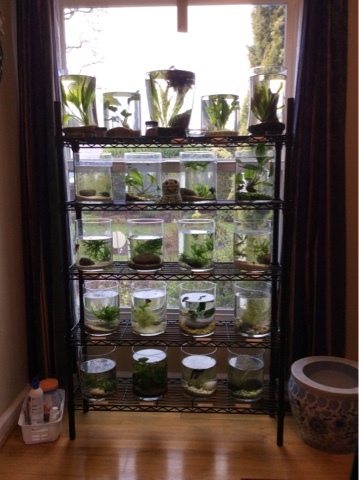 I can bring you some java moss or java fern if he needs some!